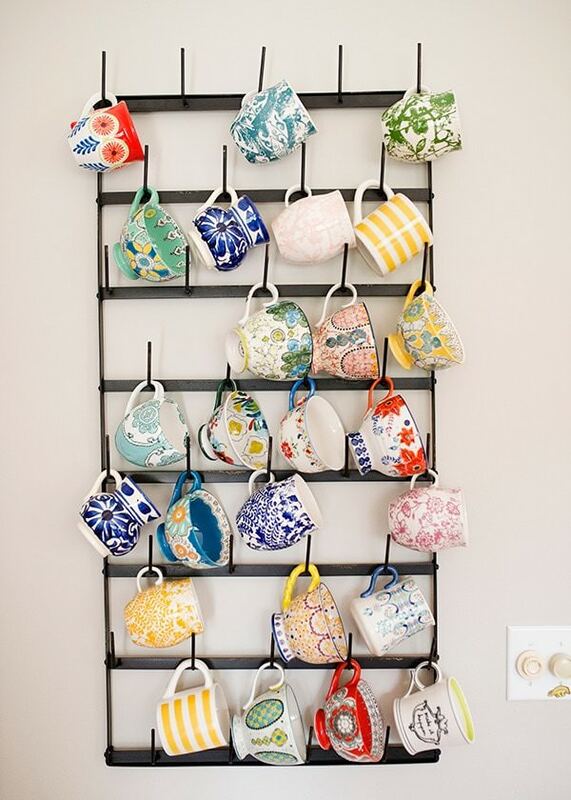 Things that make me happy – my mug collection and hanging mug rack. I don’t know when or how it even started, but there are very few things that make me happier than an a colorful mug. Maybe one with an initial on it. That’s a very close second. I started buying a mug whenever I went to anthropologie. I love them and they make me so happy. I drink a lot of coffee and tea and I pick a mug based on my mood or what color I’m feeling that day. I started picking up pretty mugs all over the place (the blue one in the lower left corner was from my trip to Mexico) and friends started giving me mugs because they knew how much I loved them. When you move as much as we do, it can be hard to make a rental feel like home. There are a lot of elements that are out of my control. Usually, they come with bare white walls (which I do happen to love) and very little personality. These mugs give me an opportunity to add little pops of color to a table, shelf, or in a cabinet. Now I’m happy to say they have their own wall. My coffee station has a cute little mug drying rack . I quickly outgrew it and the shelves underneath. I was watching Fixer Upper and Joanna has a large hanging mug rack in her kitchen. I went on a search for one and think that I was using the wrong keyword search. I couldn’t find what I was looking for. Wes hung it up this weekend and I can’t even begin to tell you how happy it makes me. It fills a spot on my wall that had been bothering me. We don’t have a lot of wall space, it’s prime real estate here. We live in a little cottage, so every inch counts. 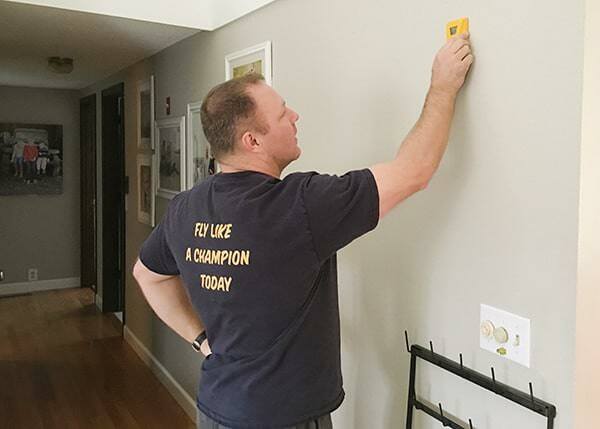 We also have outlets, thermostats, and furnace shut off switches in the most random places on the walls. The furnace shut off is bright red in the middle of the hallway about a foot from the ceiling. Weird. I think that I might order another one because 1.) it will take up more space (it is a little smaller than I thought it would be) and 2.) it gives me an excuse to buy some more mugs. 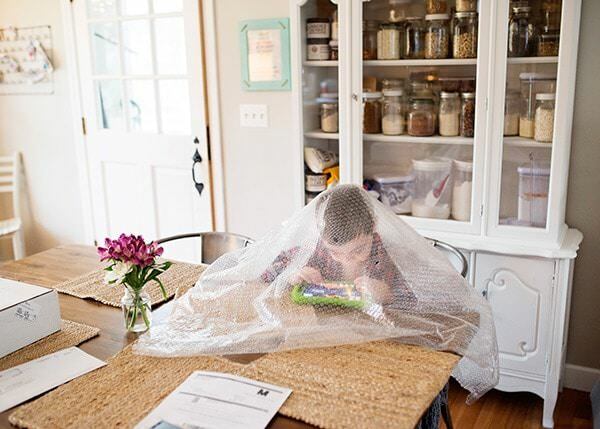 Clay really liked the bubble wrap that it was wrapped in. He stayed in his “bubble” all afternoon, only to get out and roll all over it to pop it. He’s BIZARRE. These mugs bring me so much happiness. I remember when I bought them, or who gifted them to me whenever I drink out of one. Disclosure: This blog post contains affiliate links. 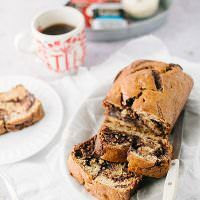 If you choose to buy a product Baked Bree will receive a small percentage of the sale at no cost to you. It looks amazing! I recently saw another mug collection and now with yours, too, I think I want to start collecting mugs!! I love this. I don’t really have any walls in my kitchen or I would love one of these. Thank you Gina! Mine is actually in my hallway, not in my kitchen. We have very limited wall space too. 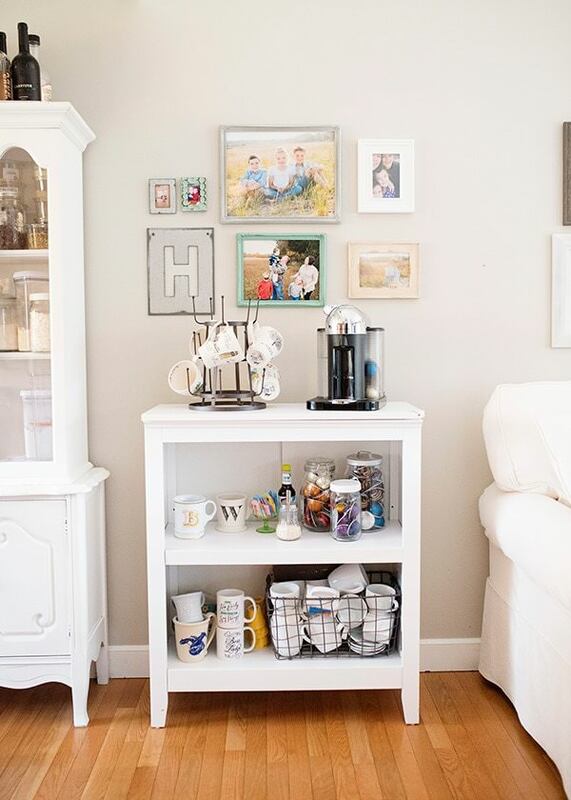 I love, love, love your coffee station! My husband and I actually plan on making one this summer and yours is absolute inspiration. P.S. Really can’t blame you for buying a mug at Anthropologie at every one of your visits. I’m in love with their bowls! Thank you! My coffee station makes me so happy. We live in a very tiny house and counter space is at a minimum. It has helped free up a lot of space. And people come in and help themselves, which I love. It adds to the cozy. Oh how I love Clay. Me too. He holds a special place in this heart of mine. Coffee mugs make me happy too! I try to buy a locally made mug on our family vacations. I have often thought of getting the standing drying rack to display them but now am thinking about the wall hanging rack. Great post! I love that idea. I buy a cookbook and write when and where we were on the inside cover. I love my hanging rack, it makes me smile every time I walk by it. I love this! 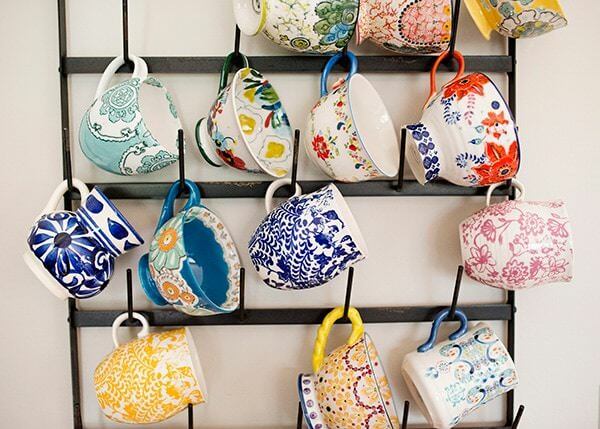 I’d been thinking of doing a plate wall, but after seeing this I’m thinking maybe a mug collection would be better (and easier!). I don’t think that rack is for sale anymore though…or at least I couldn’t find it. I might have to get creative and make something. 🙂 I’ve been eyeing the anthropologie plates for a while now…I’ll have to check out the mugs. You can find them from other places, that is just where I got mine. What an a$$hole. I completely understand hurting over a mug, I’m so sorry that he did that. Oh my… THEEE CUTEST mug collection ever! LOVE! but I don’t see it at her shop…maybe it will come back? I think that a lot of things come in and out of her shop. I would try looking for one on etsy too. I loved this too, as every coffee mug I have is a little piece of my history. The trips that my kids have made, and the adventures in my life. I still have a coffee cup from one of my high school friends (from high school…cough, cough…in the 80’s). Love your rack! I love that! My mugs make me so happy. I don’t drink coffee or tea, and I have never really been a fan of mugs–probably because I am not a coffee drinker. However, do love pretty things and pretty colors, and I LOVE the idea of using this for color. I might have to start collecting! 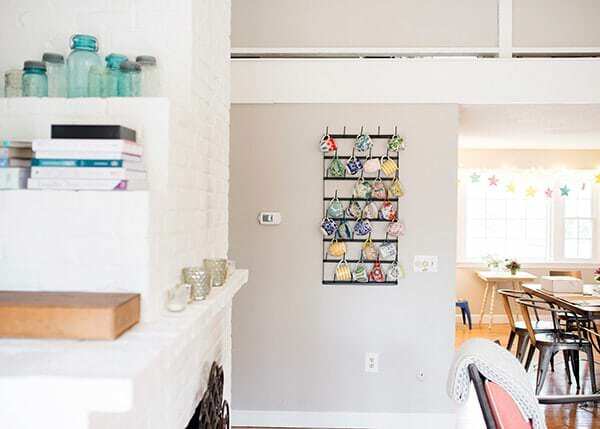 My creative wheels are turning, and I am thinking a singular, linear, hanging rack filled with beautiful mugs would make a whimsical window valance in a kitchen. I am glad that you like it. I bought some new ones this week! So where did the rack come from please? 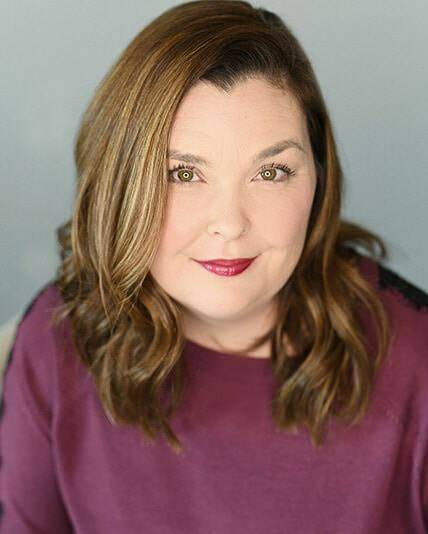 It is linked in the post, but here it is again. I loved your blog, everything about it. Especially the mugs, the holder, the Recipes! !, and just how happy it made me. I’m renting a room. Can’t manage to muster much happiness, but dream of when I have my own home. We always rent because we move so much, you can make some happy in any space. Don’t give up! I don’t know where to buy the coffee rack. Can you help me? What a fabulous idea. It looks so colorful. Thank you! I love them so much. Love your cups. You have collected a colorful and happy group. I have a plate rack in my kitchen. It holds my hand painted ceramic plates. It’s the first thing visitors see and comment on. I love having a conversation piece. I love the plate idea. I used to have plates hanging on my walls. I began collecting a different mug every time my family and I went to a Renaissance Fair. Then I started getting one from every place i visited. 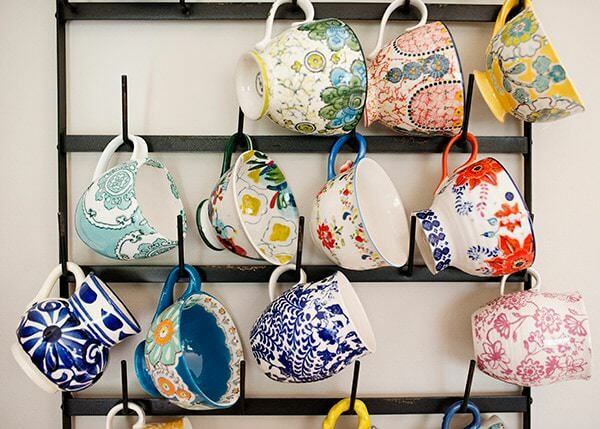 I love the cup rack but I’m not sure if my mugs will fit as some of them are large. I do have a dainty cup and saucer rack in my kitchen that holds 4 sets of different, old fashiony cups and saucers. Some of my mugs are at present in a curio cabinet. Others are scattered thoughout my house. I love that tradition. I have a few that are too big for my rack and display them in different parts of my home. I also love mugs and have been searching for a way to display them, but this is a little steep for my limited income. Any suggestion on how to come up with something cheaper. They go on sale and I am sure that you can find a knock-off somewhere. World Market has the French style racks sometimes.